Dynamic XD 5-Axis Waterjet - Kuhn Tool & Die Co. Kuhn Tool & Die Co. 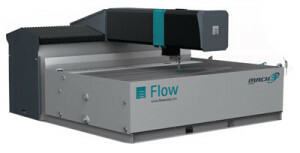 The Flow Mach 3 Waterjet provides very high precision waterjet cutting capabilities – from simple straight sided geometry to complex tapered sided parts. We can cut virtually any material up to 6″ thick with no “heat affected” zones. We can handle material sizes up to 5′ x 10′ with a cutting area of 4′ x 8′. You provide your own designs, or let our in-house design department take your ideas and provide the design to cut them wet.